The version tested is the 2.3.2 Beta 1 release, put out earlier this year, running on top of Kubuntu 10.10 Beta. Amarok improved a lot since I last took a look at it (I'm still using KDE 3.5 with the old - but stable - Debian Lenny). Minuses compared to the 1.4 version are lack of statistics, stability (it's less stable and reliable - it's one of the players which at the moment can ruin your listening experience by crashing or making other surprises). I'm sorry to say this as an Amarok fan and promoter, but this is the truth as I see it. Scanning the collection is very fast in 2.3.2, and I was really impressed to see that in less than four minutes Amarok successfully scanned a collection of almost 9000 audio files (Ogg and FLAC formats only), and populated the playlist in a little over 1 minute with all of them. That's on my Core 2 Duo 1.8 GHz. The problem with the playlist is that Amarok still has issues with categorizing songs which are part of a compilation by different artists, and this results in a messy playlist. I talked about this probably over one year ago, but it seems it hasn't been fixed not even until today. 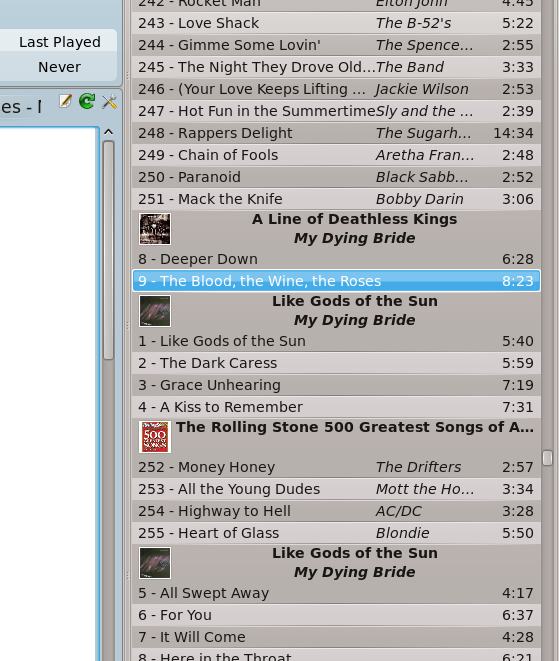 Also, it fails to correctly fetch album covers which are in the same directory with the songs from an album. This is frustrating and pretty much... amateurish. I mean, it's been over two years now! The configuration window allows to customise general settings, like enabling/disabling the system tray or the OSD, select which web services you want to have listed in the left panel, show moodbar or configuring an external MySQL database for the music collection. klauncher said: Unknown protocol ''." I really don't know whether this is Amarok's fault, or Phonon's. This happened after hitting Ctrl+J to jump to the search box and typing an artist in there, then Enter. Amarok refused to play any more songs after this, even after restarting the X Server and logging back in. If someone can help me with that, I'd be truly thankful. Of course, I have to mention again that this is only a beta, and it was tested in a beta distribution too (I guess by this time we all know about the quality of Kubuntu releases). Overall, Amarok 2.3.2 has powerful features, and it surely looks like a lot of work has been put in it (well, except for the playlist problems), but thing is, a lot of people still prefer the older 1.4.10 player, which is rock-solid compared to its KDE 4 port. People seem to keep complaining about Amarok 2 (and KDE 4.X), but i'm not sure why. I'll admit it was pretty terrible for a while, but the last couple of releases have given me very little problems. You keep mentioning bugs...well your reviewing a beta release, so what do you expect? I'm really tired of people reviewing Beta software and complaining about bugs! I'm using 2.3.1 and rarely come across a bug. Apparently it can't sort playlist properly, except it has 20+ ways to sort your playlist. Sort it by album instead of artist if you want your compilations to show up properly. Or maybe your tags are not done right? 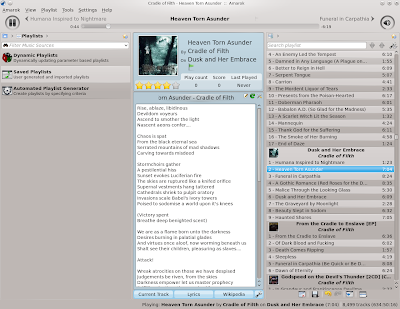 I used to use the original Amarok, but not because I thought it was amazing, just because it was the best music player on Linux at the time. It was ugly, and it still had bugs and crashed every so often. It also had it's own quirks with how it dealt with your playlists. Every different player seems to sort your music slightly differently (or improperly). Once I found out about songbird I used that for a couple of years (at the time I dual booted and was used to Itunes). As buggy as Songbird was, the original release of Amarok 2 was much worse. Since Songbird stopped supporting Linux, I gave Amarok 2 another try and haven't looked back. The problem is that too many people expect it to be exactly like Amarok 1.4, but it's not, it's a completely different player. If you like 1.4, keep using it, but just like the old and ugly KDE 3.5, it's not as perfect and flawless as a lot of people seem to remember. 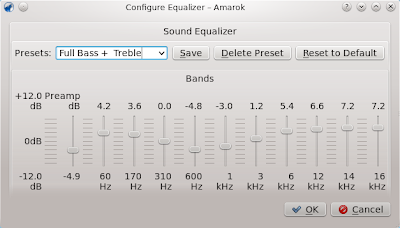 It is just my opinion, but I would argue that Amarok 2 is the best all-around music player that Linux has to offer right now. It is a tad disappointing to read a post that announces the Amarok 2.3.2 beta Review and then only have it compared to Amarok 1.4. That ship sailed quite some time ago... It would have been interesting to see how it handled on a stable release (ie Kubuntu 10.04 or openSUSE 11.3). That way any bugs and crashes can be blamed solely on Amarok. Just a few pointers for a better post next time. However, I'd also like to add two annoying things about Amarok 2. First off, you can't copy a file/s to an MP3 player from the playlist. This is especially annoying if you just created a dynamic playlist and had to find each individual track. Further on this matter, it would be a great feature to import the entire playlist as such to the MP3 player, as in a m3u or such. However, I believe this to be a limitation of libmtp. 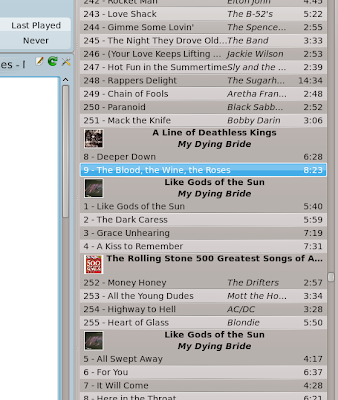 Secondly, the whole program is set out to use dynamic instead of static playlists. What I mean is that if you compare Amarok to iTunes, banshee, rhythmbox,... is that in those applications you choose your favorite songs and then drop them into a playlist. This allows you to collect your favorite songs in one place. In Amarok however, this is not a workflow that works that well. Firstly, because the static playlists ("saved playlists" in Amarok speak) have to be digged for. Additionally, the actually working implementation (Not available in Rythmbox and questionable in Banshee, Listen does it quite well but has other major faults (no ipod or mtp support) of last.fm and echonest automatic playlists is just too easy to be bothered most of the time to manually collect songs. Any how, hope this is useful to someone. Nice review - Glad to see others see Amarok's development continue to make strides in KDE 4. I agree with the comment above - running on a stable release and comparing to the other big 'buntu media player, Rhythmbox, might have made more sense. But I can see your point in the inevitable comparison to 1.4 since they both share the same name, etc. 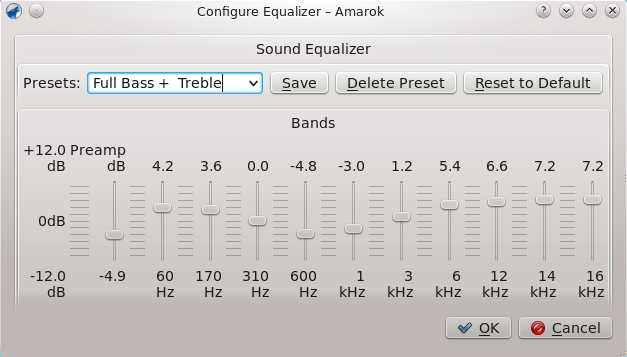 I've been listening / using Amarok for over a year now without issue. Simply put, it rocks. My only pet peeves are lack of native visualizations (which I understand might be coming soon), lack of a working mood bar OOTB, and as you mentioned - somewhat hit-or-miss Various Artists and compilation managing. Podcasting continues to improve and is what I use for managing them now. Overall, I'm quite impressed. Also, look for a good Windows installer to be released soon. This is when Amarok should really make a statement and gain more support / developers - sad to say but true. Waiting until Amarok 2 is stable and some of the issues that you've pointed out are resolved. In the meantime, try Clementine, it's a fork of Amarok 1.4 and is enough to get by with until 2.x is usable (which I'm sure it will be soon). Amarok 2.3.1 is very stable. I can even use it with phonon-vlc backend. The article is about beta version, so all of this unstability can be sorted out before the final release. I'm sorry but this version of Amarok seems like a big step down from the KDE 3.5 versions. I can't sort my playlist!? It's so rudimentary, and yet I can't find any way to do it. "Hiding" functionality to make the UI look better translates into making it impossible to use. I don't care how awesome it looks, it had better be able to replicate the original core functionality first, look awesome later.